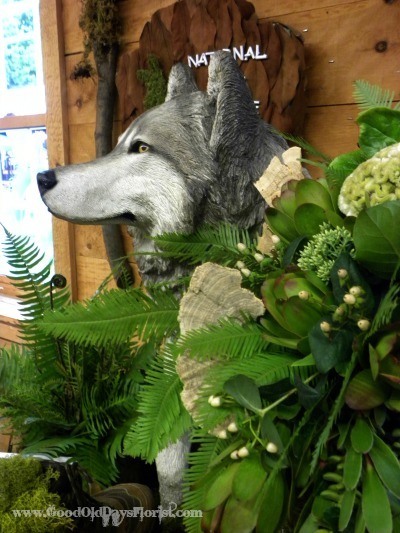 As the Duchess Fair kicks off, it is time for the competition, floral displays to beautify the Horticulture Barn. With a theme this year of ‘passport to the world’ I knew immediately only one idea I would create. My passport is and always will be to any of our National Parks; the most awe inspiring places in the world. There is no need to travel around the world when we have these magnificent places right here in America. From Acadia to Yosemite, each having it’s own magic to take your breath. This year is the 100 year centennial and John Muir would be proud for all these precious areas that have been saved. 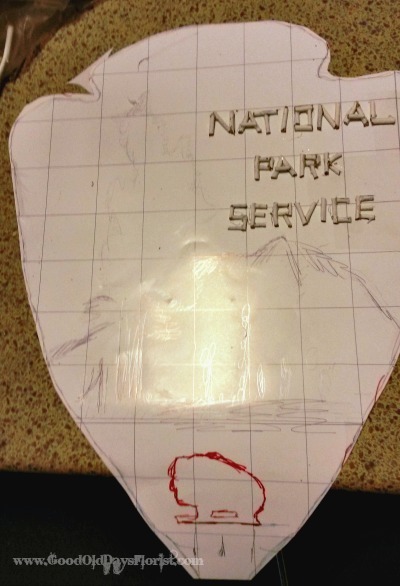 The National Park Service has a great promotion to ‘find your park’ and I hope you will. As always, everything I do is complicated. Nothing good is ever easy my grandfather would say-he was right. Whenever I see something easily put together I am not impressed. Easy is ok-but complicated is great. 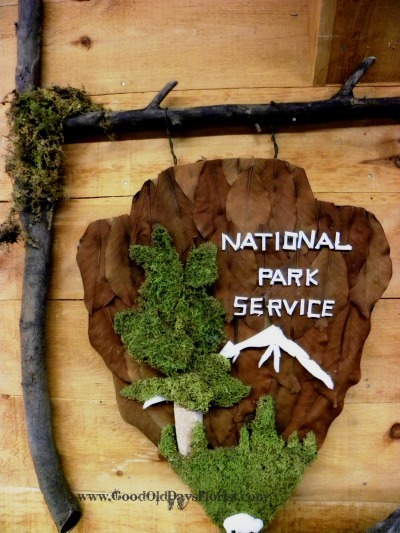 My first component idea was to recreate the National Park Service sign seen in every park; and not a carnation thing but yet with all the detail made in natural leaves, twig, and moss. Yes, a nightmare of time. I started with a picture.. then graphed it.. and then copied it meticulously with ‘gifts from nature’. 6 hours later I was searching in the yard for the 2 perfect branches to nail into a sign bracket. From there the display was all clear in my mind. 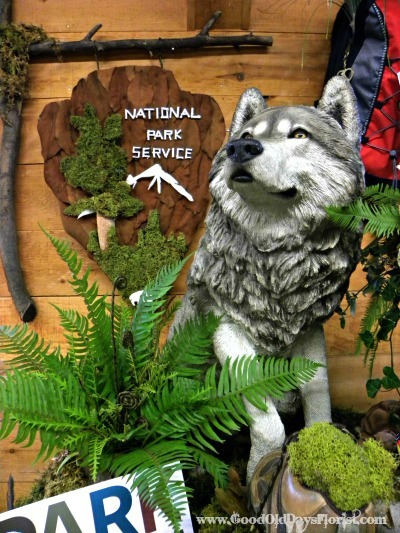 Moms life size wolf, my precious white birch stump & logs, my old hiking boots (which I hiked through Yellowstone with), my backpack from Glacier, and moss, moss, and more moss. 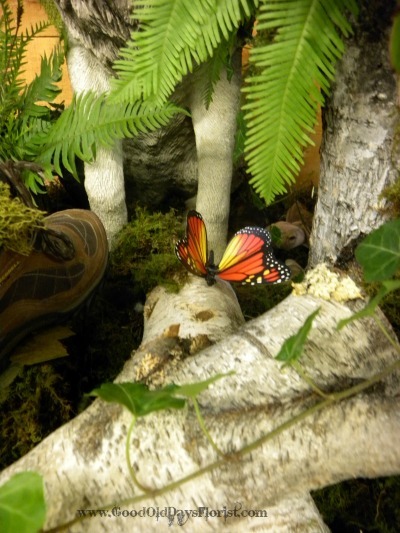 A turtle here and a butterfly there, a found Montana antler, and feathers from Muir Woods In CA Easy peasy when you already love what you are recreating. Which is why I always tell my students, ‘create your passion’as the design will come to you naturally. 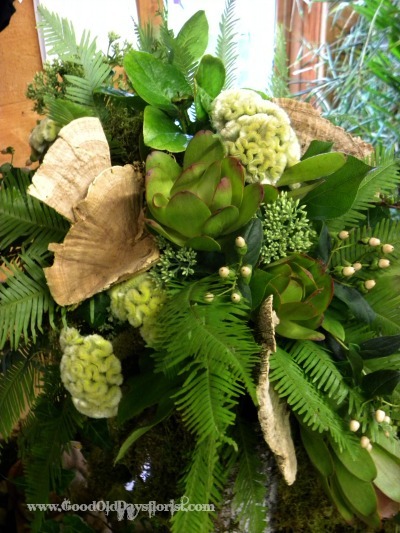 Of course what better way to celebrate than with an arrangement of American grown flowers. 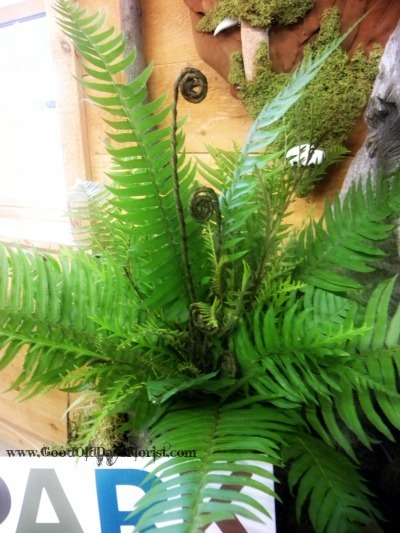 No South American or African flowers & goods here! 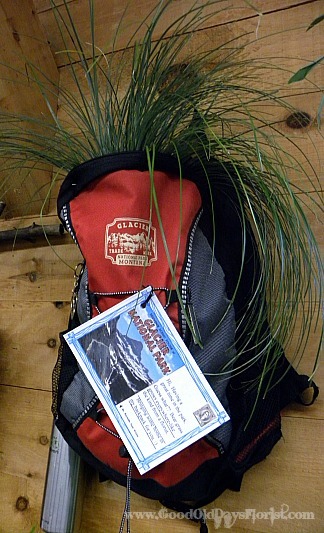 FYI-Bear grass grows wild everywhere in Glacier-hence why I stuffed my backpack with it. Adding a vintage postage card finished it off. I hope you all will get the chance to #FindYourPark in your lifetime as they are an unspoiled environment just as Mother Nature intended. There is a peace in this nature because we are nature. The moss is our grandmother and the trees are our brothers.